This innovative book sets forth and describes methods for the analysis of longitudinaldata, emphasizing applications to problems in the biomedical and behavioral sciences. Reflecting the growing importance and use of longitudinal data across many areas of research, the text is designed to help users of statistics better analyze and understand this type of data. Practical in their approach, the authors emphasize the applications of the methods, using real-world examples for illustration. Some syntax examples are provided, although the authors do not generally focus on software in this book. Several datasets and computer syntax examples are posted on this title's companion Web site. The authors intend to keep the syntax examples current as new versions of the software programs emerge. 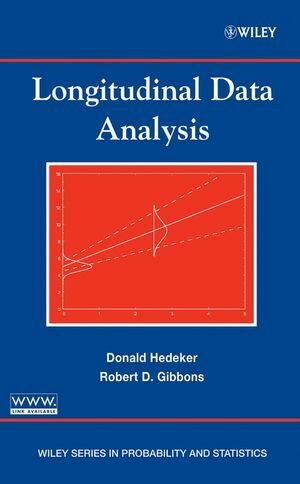 This text is designed for both undergraduate and graduate courses in longitudinal data analysis. Instructors can take advantage of overheads and additional course materials available online for adopters. Applied statisticians in biomedicine and the social sciences can also use the book as a convenient reference. DONALD HEDEKER, PHD, is Professor of Biostatistics in the Division of Epidemiology and Biostatistics, School of Public Health at the University of Illinois at Chicago. He is a Fellow of the American Statistical Association and the author of numerous peer-reviewed papers. ROBERT D. GIBBONS, PHD, is Director of the Center for Health Statistics; Professor of Biostatistics in the Division of Epidemiology and Biostatistics, School of Public Health; and Professor of Psychiatry in the College of Medicine, all at the University of Illinois at Chicago. He is a Fellow of the American Statistical Association and the author of numerous peer-reviewed papers. 1.1 Advantages of Longitudinal Studies. 1.2 Challenges of Longitudinal Data Analysis. 1.7 The Simplest Longitudinal Analysis. 2. ANOVA Approaches to Longitudinal Data. 2.2 Multiple-Sample Repeated Measures ANOVA. 3. MANOVA Approaches to Longitudinal Data. 3.1 Data Layout for ANOVA versus MANOVA. 3.2 MANOVA for Repeated Measurements. 3.3 MANOVA of Repeated Measures-s Sample Case. 4. Mixed-Effects Regression Models for Continuous Outcomes. 4.2 A Simple Linear Regression Model. 4.4 Random Intercept and Trend MRM. 5. Mixed-Effects Polynomial Regression Models. 7. Mixed Regression Models with Autocorrelated Errors. 7.2 MRMs with AC Errors. 8. Generalized Estimating Equations (GEE) Models. 8.2 Generalized Linear Models (GLMs). 8.3 Generalized Estimating Equations (GEE) Models. 9. Mixed-Effects Regression Models for Binary Outcomes. 9.5 Mixed-Effects Logistic Regression Model. 10. Mixed-Effects Regression Models for Ordinal Outcomes. 10.2 Mixed-Effects Proportional Odds Model. 10.4 Health Services Research Example. 11. Mixed-Effects Regression Models for Nominal Data. 11.1 Mixed-Effects Multinomial Regression Model. 11.2 Health Services Research Example. 1 1.3 Competing Risk Survival Models. 12. Mixed-effects Regression Models for Counts. 12.4 Mixed-Effects Models for Counts. 13. Mixed-Effects Regression Models for Three-Level Data. 13.1 Three-Level Mixed-Effects Linear Regression Model. 13.2 Three-Level Mixed-Effects Nonlinear Regression Models. 14. Missing Data in Longitudinal Studies. 14.3 Models and Missing Data Mechanisms. 14.5 Models for Nonignorable Missingness. Specific computer syntax and data sets are available via a related website. Overheads and additional material are also available online.